Witches love chanting spells especially for love… Love spells are the magic formula for getting the one you love and making sure that they are under your spell. Magic is a psychic energy which we can all create, it is generated in the mind and uses natural energies such as the Sun, Moon or Venus, herbs, crystals, sea shells, aromatic oils and incense and so on to grant your wish and make it reality. It is rumored magic spells as an established system first appear 5000 years ago in ancient Egypt and has evoked over the centuries in numerous different directions. Love spells use materials, words and actions. You may cast your own simple love spell or if your heart is really breaking you might prefer to use a professional witch so that your negativity is not picked up during your spell casting. Casting a love spell for attraction is simple because you are full of hope and positive, casting a love spell to erase heartache is difficult because you cannot focus on a positive outcome and as soon as you put out a magical request for your lover to return, your negativity that he or she won’t recalls your wish, in which case you should seek a professional witch who is able to alter their state of mind and remain only positive as they send your wish out into the universe to be granted. Your witch will protect your spell from being affected by your natural pain, hurt, heartache and depression. Professional love spell witches can work on the higher realms and cast an amazingly powerful love spell for you. Here is a simple love spell to attract love. A red or pink candle and piece of paper. Light your candle. Write down the intention of the love spell you are casting on a new piece of paper. As you write down your request, visualise your desire, visualise it as manifesting. Next carefully fold the paper you have written your wish on while you think about your desired outcome. Place the corner of your folded paper into the flame of the candle until it catches light, again concentrate on what it is you wish to happen. When you have finished casting your spell, please allow the candle to burn away totally, when it burns away it creates the energy to cause the love spell to succeed. You do not have to stay with your candle, but ensure it is safe and will not cause damage or fire. Recalling a love spell is easy, you simply decide you no longer want your wish, this creates a ‘thought form’. Thought forms are psychic energy and are used in a love spells casting. How long does a love spell take to work? From the very moment your love spell is cast it becomes alive and is working on your wish, but how fast it will work depends on numerous factors; your situation may be very complex, others such as love rivals or interfering third parties may be involved. If you have fallen out bitterly with your lover who is refusing to discuss your situation or even just talk to you, this will ensure your love spell has a big job on its hands and to expect instant results is unreasonable. As the magic takes hold, you might get a phone call or perhaps the one you love will wonder why they cannot get you out of their mind all of a sudden after the casting of your love spell, they may dream of you too, but that isn’t full results, your love spell will have to work on the issues that ripped your relationship up in the first place. Personalities come into it, some people cope by burying their head in the sand and refusing to face up to reality, they will not even be honest with themselves, they stubbornly fight their true feelings and should anyone ask how they feel about you, they will say they don’t think about you these days, you are history, and yet that’s not how they feel deep down, on the surface yes because they are refusing to face up to reality, kidding themselves, but deep down the opposite is true. With all these complex emotions at work it is ludicrous to expect results to appear overnight. A less confusing situation will get faster results. Time and space exist in the material world, they are not a feature of the invisible spell world where past, present and future are all the same, this can make it extremely difficult for a witch to predict when you can expect your results. Of course, though rarely, magic is not an exact science, but a craft. The failure of a love spell DOES NOT mean you have to give up hope, it means your situation needs reviewing and working on once more. 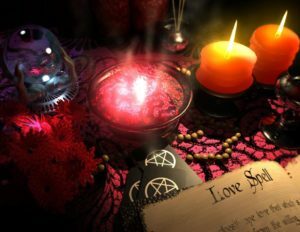 Some witches cast more than one love spell, they cast several different ones this is because they wish to ensure as many potential problems are covered as possible and they may feel your situation has fast moving energy, that is your case is altering fast, for example your lover might have started a new relationship and developing strong feelings for another swiftly. Can a love spell backfire? No, if a spell can’t obey the instructions a witch has charged it with it will simply fail to do anything. During a love spell the witch alters their brain wave frequency, they move from the conscious beta, to the subconscious alpha, here they control their thoughts and block anything negative or bad and work only with ‘light’ energies which vibrate at a high frequency unlike negative energies which vibrate at a low rate and can be blocked easily by a witch in alpha brain wave mode. Is it wrong to cast a love spell? Not at all, magic love spells are as their name suggests ‘magical’, warm, wonderful and loving, they are about love and being positive and happy. Why do witches charge to cast a love spell? Everyone wants something for free, but only those who are very serious will be willing to invest financially in a love spell. Spells can be very expensive to cast, and time consuming. It is essential everything is done carefully and properly, a 5 minute love spell with an old candle you have left over from Christmas will not work at all. A truly powerful love spell is cast within a circle, invokes a deity, raises and releases, and directs energy, and energy fueled by sumptuous oils, gemstones, candles, incense, herbs and many other rare and exotic ingredients. Your witch will study your situation, make many calculations he or she wishes to include in your spell. You cannot expect that for free, and spell casting is a full time job and will be your witch’s only job. All professionals charge for their work, a doctor or lawyer, and all professionals provide you will the best possible services they can. If you have a love problem that needs specialist attention seek professional help from a witch, otherwise you may waste valuable time while your troubles deteriorate further. Must a love spell use a biological link to you? No, not at all, when a witch is in alpha state and connecting to the Universe on a psychic level individuality no longer exists, at this level everything is interconnected and a witches thoughts are potent, nothing biological is needed at this stage, in fact a witch could work with two peoples names. A witch may ask for various details or photos so that she has a picture of you in his or her mind’s eye. It is also possible a witch may burn a lock of hair or photo during a love spell; there are so many different love spells requiring different items and techniques, therefore if a witch insists they need a lock of hair, that may well be true for the type of love spells they cast, yet it is also true a powerful love spell can be cast without any biological items. Different witches have different ways!